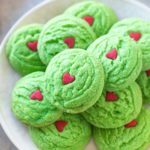 Inspired by Dr. Suess’s The Grinch Who Stole Christmas, these dairy free Grinch cookies are a simple, colorful way to get your kids into the holiday spirit. Makes 30 cookies. 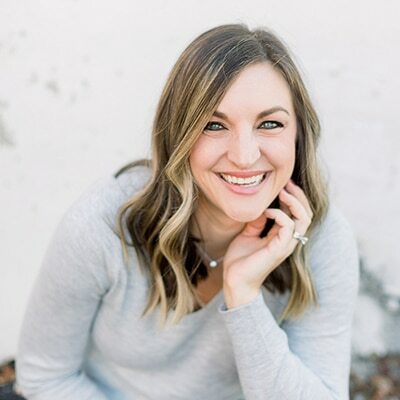 I’m sharing this recipe as part of The Sweetest Season Cookie Exchange, an annual food blogger cookie party and fundraiser, so be sure to click over and check out all the delicious cookies! Last year when we were in Canada visiting Marc’s family, Ellie watched the Grinch for the first time. And she watched it for the second, third, fourth and fifth time, too. I swear she watched it everyday after that until we came home. That’s a lot of Grinch-watching. This year, St. Nick brought her the book, and I’m sure we will read it over and over until Christmas is over. Probably into the New Year. 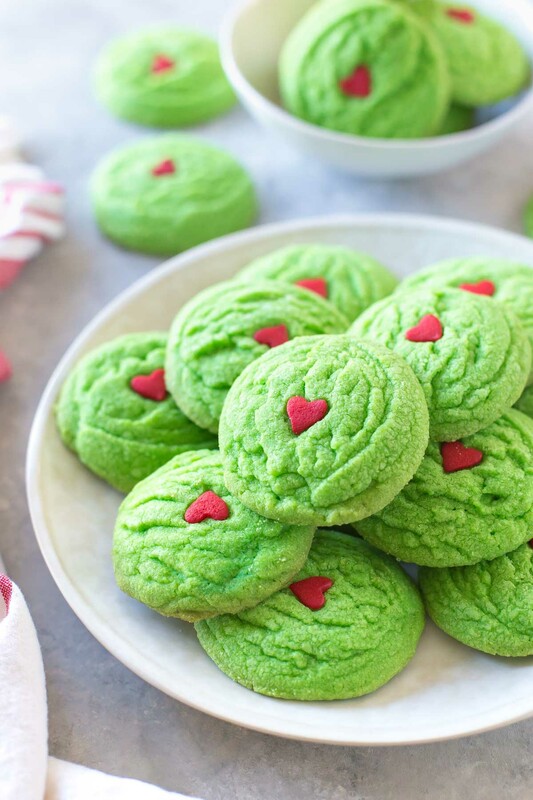 When I saw these Grinch cookies on Pinterest, I knew she would think they were awesome. The only probably was that there wasn’t a single dairy free recipe for them, and most of them were made from cake mix, which isn’t my first choice when it comes to baking, even if it is convenient. 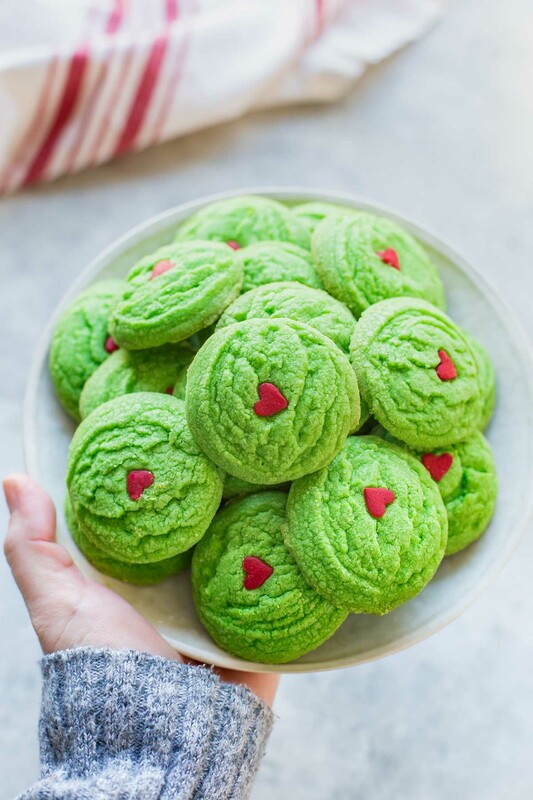 But, Grinch cookies are really just green cookies with a red heart in the middle, so I decided to tweak my favorite iced sugar cookie recipe to make it icing-free, and we added just the right amount of green and yellow food coloring to make the cookies the perfect Grinch color. To make the cookies the perfect texture of Grinch fur, I used a cookie scoop and let it do the work for me. Just scoop and release. And, top with an extra big heart. I found these extra large heart quins on Amazon, and they were just the right size. But the best part about these cookies? You don’t need a fancy stand mixer. 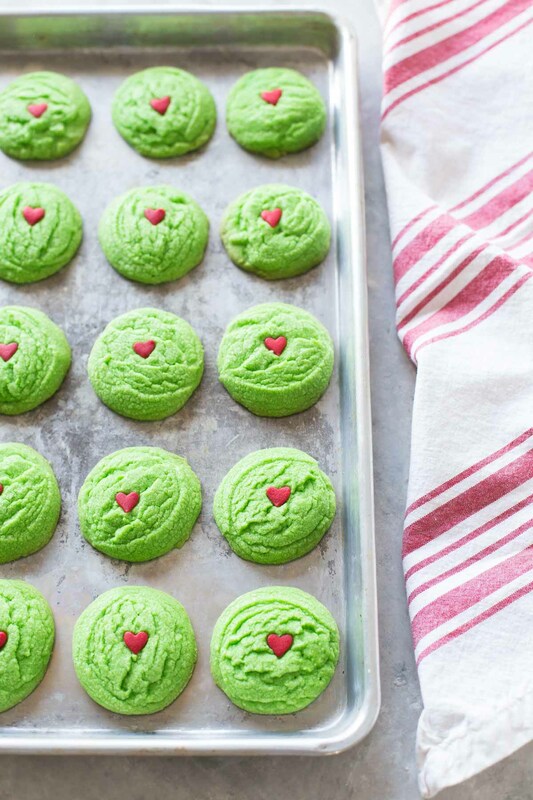 They’re simple enough to make them with a hand mixer and any big bowl you might have. I’m sure these cookies are going to be a yearly tradition in our house (along with these cookies), and they’d be a perfect addition to your cookie spread or a nice a change of pace for your next cookie exchange. And, don’t forget to make some dairy free hot chocolate to go with these. 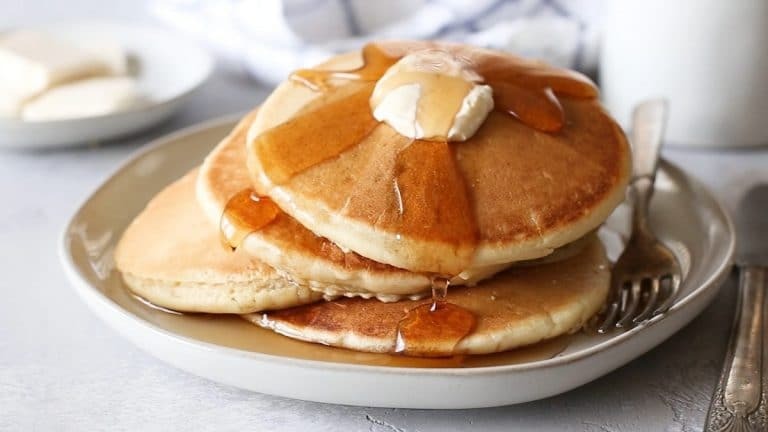 In a medium bowl, whisk together flour, powdered sugar, baking powder and salt – set aside. Add egg, vanilla and peppermint extracts. Beat until combined. Add flour mixture in ½ cup increments, mixing to combine and scraping sides when necessary. Add food coloring until desired color is reached and mix until even. Using a small cookie scoop, scoop dough (do not smooth scoops) onto cookie sheet about an inch or so apart. 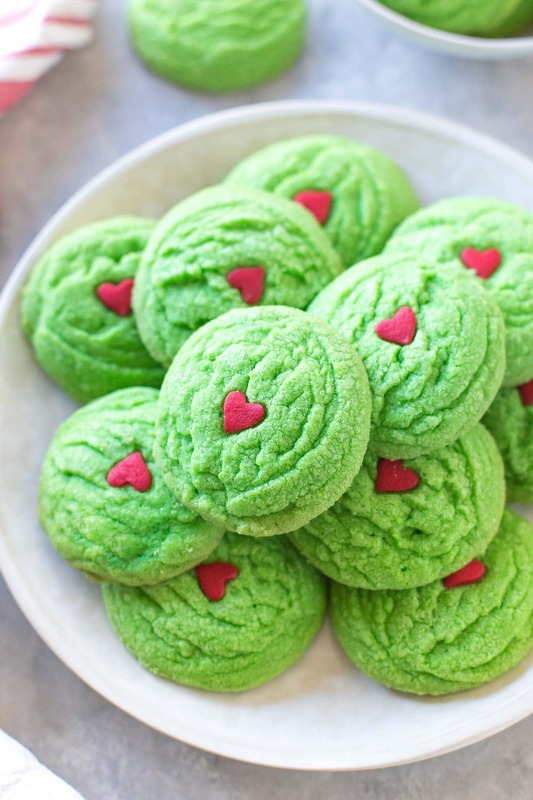 Top each cookie with a heart. Bake cookies for 10 – 12 minutes or until cookies have spread and dough is set. Remove from oven and allow the cookies to rest for several minutes before transferring them to a cooling rack. The flavor is really good but my cookies never fell. What do you mean they never fell? These are the best! 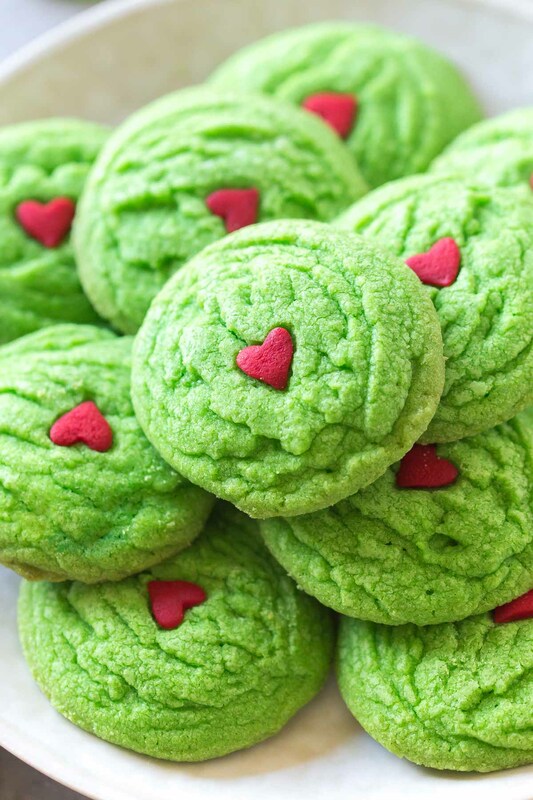 They are chewy and soft with just a hint of peppermint, and they’re so cute! Where did you find the vegan hearts? Everything I’ve found has confectioner’s glaze (shellac) in them. I didn’t. These cookies aren’t vegan, they just don’t have milk in them. I used Wilton hearts and they do contain confectioner’s glaze. Sorry! I have no idea where you would be able to find vegan ones. I did a quick search and couldn’t find anything. If I see anything I’ll let you know.